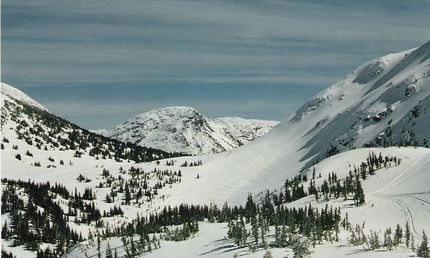 Site Description: A snowmobile trail system with fees maintained by the Merritt Snowmobile Club. The majority of the trail is groomed and signed and proceeds up onto Thynne Mountain via the Thynne Forest Service Road where two shelters are also maintained by the club; The Tin Shed and the Andy's Lake Emergency Shelter, the latter located on the north shore of Andy's Lake. Please respect these buildings and keep things tidy and bring all garbage home with you. Driving Directions: The Merritt Snowmobile Club maintains a parking lot/ staging area a short distance past the community of Brookmere and the 0 km mark of the Thynne Mountain Forest Service Road. No camping and no fires at the parking lot. Site Description: An 86 kilometre snowmobile trail network with fees maintained by the Merritt Snowmobile Club. All fees go towards grooming, trail and cabin maintenance and safety programs. Note there is some avalanche terrain and chutes in the area so it is wise to review the avalanche conditions and terrain/snow conditions prior to sledding and periodically through the day. There is the Honeymoon Cabin located in the area. Please respect this cabin and keep things tidy and bring all garbage home with you. Driving Directions: Proceed west for about 15 minutes along Highway # 8 from Merritt. Watch for signs indicating snowmobile trails and turn left onto the Spius Creek Road. Continue on this road, past the fish hatchery, over the bridge and continue on the main road for 7.5km where there is a gravel pit and a large trail kiosk(9k). Park and unload your sleds here, review the avalanche terrain and trail map and proceed further up the road by sled to the trail system. If the road is plowed or otherwise driveable beyond the gravel pit you may also park your vehicle and unload at or near 24k.It is recommended to carry chains and be aware there are limited areas to turn around before 24k. Regulations prohibit the driving of snowmobile on plowed or otherwise driveable roads.